Follow fatigue and ageing of implants. Structure and dissolution models of pills. Structure of drug delivery vehicles. Watch medical devices under operation. Prior PLM Medical, a company that specialises in supporting the medical and pharmaceutical industry to develop drug delivery devices from initial idea to end of product life. According to the World Health Organisation, over 300 million people worldwide suffer from respiratory diseases such as asthma and chronic obstructive pulmonary disorder (COPD). Inhaled medicine, typically in the form of pressurised metered dose inhalers (pMDI) and dry powder inhalers (DPI), is used to treat these diseases due to the direct delivery and reduced side effects. However, device/treatment efficacy is often quite poor with only 10-20% total lung deposition for most devices on the market. The dynamics of the plume up to the point at which it exits the device are thought to influence speed and aerodynamic particle size distribution (APSD) and are considered important to drug transport to the lungs. However, this internal behaviour within the inhaler is not well understood due to the transient nature of the event and the difficulties in accessing the internal chambers within the device. PMDI devices were investigated with a range of canisters, containing either HFA 134a or HFA 227ea propellants and various valve types, inserted into the actuator. A monochromatic X-Ray beam was used at beamline ID19 at the European Synchrotron Radiation Facility. A Prior PLM Medical custom-built fixture was used to shake and actuate the inhalers. Phase contrast X-ray video of the dose release event from each inhaler showed the propellant mixture behaviour inside the canister and actuator. In addition mechanical interactions could be viewed taking place. This has provided new insights and is of value as a validation method for modelling efforts. X-rays are capable of penetrating inhaler devices to visualise internal features but conventional techniques, for example industrial CT, are too slow to investigate fast events such as inhaler dose release. 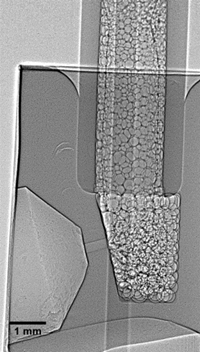 The ESRF beamlines have sufficient intensity to achieve the required temporal resolution and the phase contrast X-ray imaging technique gives excellent contrast for the low atomic number polymer/propellant/drug materials involved. “Our work at the ESRF has allowed us to see what’s happening inside both development stage and off-the-shelf commercial inhaler devices and has enabled our clients to make informed design decisions. We also use the facility for our own internal R&D programmes and are very excited by the prospect of the ESRF Extremely Brilliant Source.” Alan McKiernan, Research Manager Prior PLM Medical, physicist. High speed X-Ray video of the dose release from a commercial Dry Powder Inhaler from Prior PLM Medical on Vimeo. High speed phase contrast X-Ray imaging of dosing event in a pressurised Metered Dose Inhaler (left) and a Dry Powder Inhaler (right).